Canadian white violets are a tall, leafy-stemmed perennial. In some geographical locations, this plant is considered an endangered wildflower. Check with local resources; if you are in an area in which this plant does not grow in abundance, do not forage. In the Violaceae (violet) family, this perennial plant grows from a short rhizome with fibrous roots, forming clumps, and it spreads by stolons. 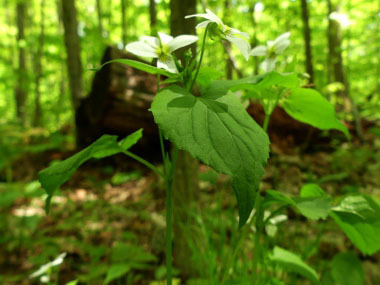 This is a plant that tends to grow in abundance in hardwood forests (beech-birch-maple or maple-basswood-ash type), usually with sugar maple as a dominant species. 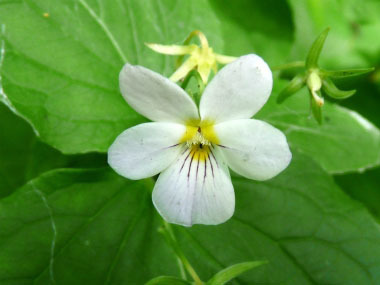 Distinguishing Features: These white violet flowers, sometimes tinged with purple, have striking yellow centres. The fragrant flowers hang and face outward at tips of short, slender, purplish stalks that grow from axils of heart-shaped, fine-toothed leaves. Leaves are long-petioled, heart-shaped, and deep-green. Flowers: Single flowers on naked stalks arise from the leaf axils. Flowers are about 3 cm (1”) across, slightly irregular with 5 white petals. It is distinctly yellow at the base, and dark purple lines on the lower petals. The side petals are bearded with tufts of short hairs. The backs of the petals are tinged purple. Flowers bloom between April and June. 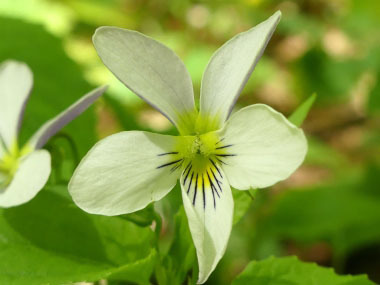 Fields of Nutrition has medicinal benefits and vitamin/mineral content of Canadian White Violet. Leaves: There are both basal and stem leaves, most are heart-shaped, 5 to 10 cm (2 to 4”) long and up to 8 cm (3”) wide, with scalloped or shallowly toothed edges and sharply pointed tips. The stem leaves are typically more elongated than basal leaves. There are fine hairs on leaf edges and along major veins on the underside. Height: This plant grows between 20 and 40 cm (8 to 16”) tall. Stems are hairless or they have a few scattered hairs, green, and often tinged purple. 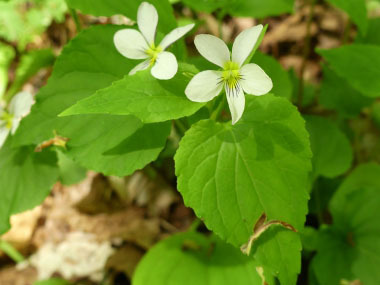 Habitat: Canada white violet prefers rich, moist soils and it can be found in moist ravine areas. 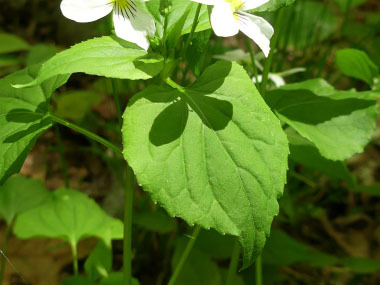 The Canada violet is normally found in healthy woodlands, although escaped cultivated plants are likely to appear in more disturbed areas. This violet prefers dappled sunlight to light shade during the spring, but tolerates greater shade during the summer. Edible parts: Young leaves and flower buds are edible raw or cooked. A mild flavour, when boiled as greens they are best mixed with other stronger tasting leaves. When added to soup they thicken it in much the same way as okra. Flowers can be eaten raw. Similar plants: Downy Yellow Violet.